With arts education budgets cut in schools across the county, WURRLYedu is an affordable, comprehensive tool for music education. Teachers manage students, lesson plans and assignments through a web-based portal, and students complete assignments and collaborate with their peers with a mobile app (Android and iOS). A catalog of lesson plans, and a wide variety of music make WURRLYedu a plug-and-play option for busy teachers, and an engaging tool for students. The process of onboarding a new user was clunky. In a round of focus group testing, we found that users were unsure of how to use the product after they signed up for a free trial. Additionally, access to the product’s core functionality was dependent on the user setting up a classroom — a process which most users did not want to invest the time into until after they were sold on the benefits. In addition - our data showed low conversion rates from trial users to paid users. The majority of the trial users did not make it through the classroom setup, and therefore could not have had the chance to explore the other features. This was a major block that I wanted to clear. 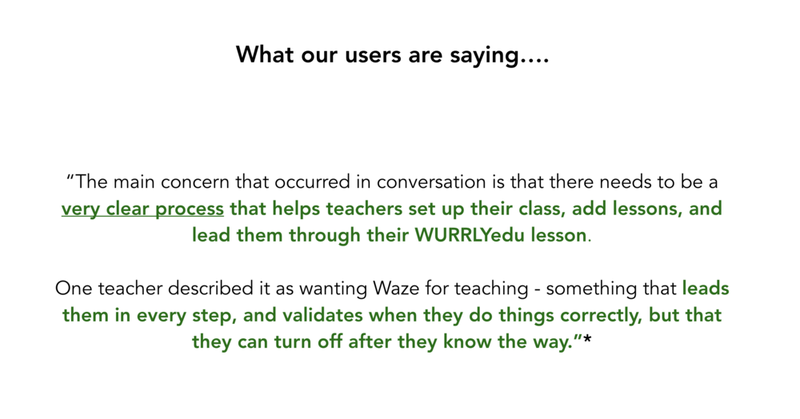 The users that did make it past the classroom set up had some sort of warm introduction to WURRLYedu, either by attending a product demo session, or through contact with our customer success representative. These users also had some sort of engagement with the product and had saved lesson plans and/or sent out assignments to students. 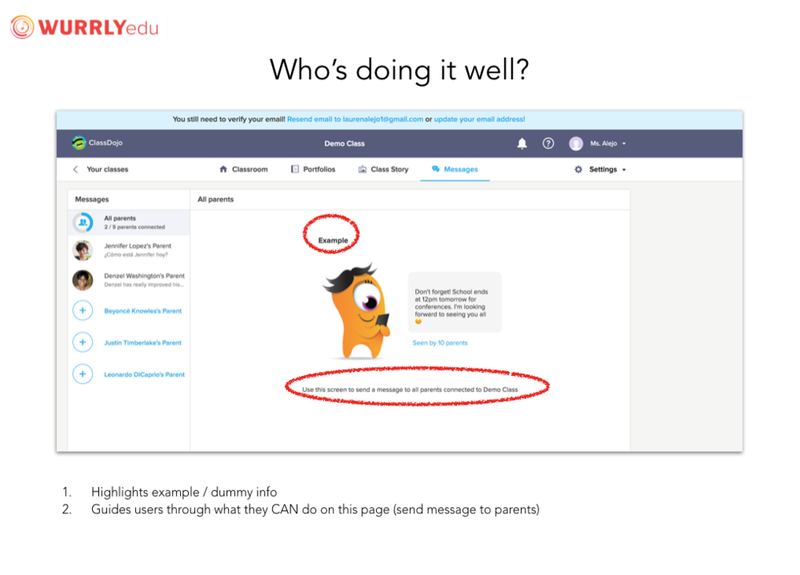 How can I create an onboarding experience that gives users a clear understanding of how to use WURRLYedu and also allows trial users to explore without commitment? I defined rough different user types so that I could better understand the use cases and opportunities for each for onboarding, (and beyond). Understanding the nuanced goals and opportunities for the trial v.s. warm users gave me a more holistic perspective to approach onboarding with. Because the product is new, our users were mainly trial and warm users. Our definitions of active and power users are in progress as finding the best way to define these. I also looked at companies and brands who were doing onboarding well in our competitive space and beyond. I liked the idea of showing users how to use the product, in the product itself. I also liked the idea of having demo content or examples of classroom applications to accomplish the goal of exploration without commitment, a suggestion that our CTO thought might work. From there I broke down the user flow for the onboarding experience so that I could visualize the steps required to complete these tasks. Based on our priorities - I first focused on designing the process of adding students to a new classroom. I also revised the product copy to accomplish the goal of having a friendly and approachable tone. Think systems, not features - in the early stages of ideation, I skimmed over how introducing new elements would impact the product overall, from the consistency of the design across different pages to the back end functionality. I now know to ask myself, “how does this affect the overall ecosystem?” when introducing a new element. Design for edge cases as much as possible — if there’s a lot of content, if there’s a little, if the user is logged in, if the user is new, if the user is on a trial… thinking of a variety of use cases in ideation will help make my design bulletproof. Have a more structured design ideation process - on a UX team of one I found myself going down unnecessary rabbit holes. After chatting with a more senior product designer friend of mine, I got some ideas of how design teams of different sizes structure their ideation (Google’s crazy 8’s for example), and I have some ideas of how I can adopt them for myself. Continue to ask for input from team members. Ideas are stronger with different perspectives. Asking for input from engineering, marketing and customer success helped me understand the problem better, and helped me see some of my blind spots.